The key to volumizing is cutting back the high calorie ingredients and adding more vegetables so that your meals are more filling…and that’s exactly what I did here. 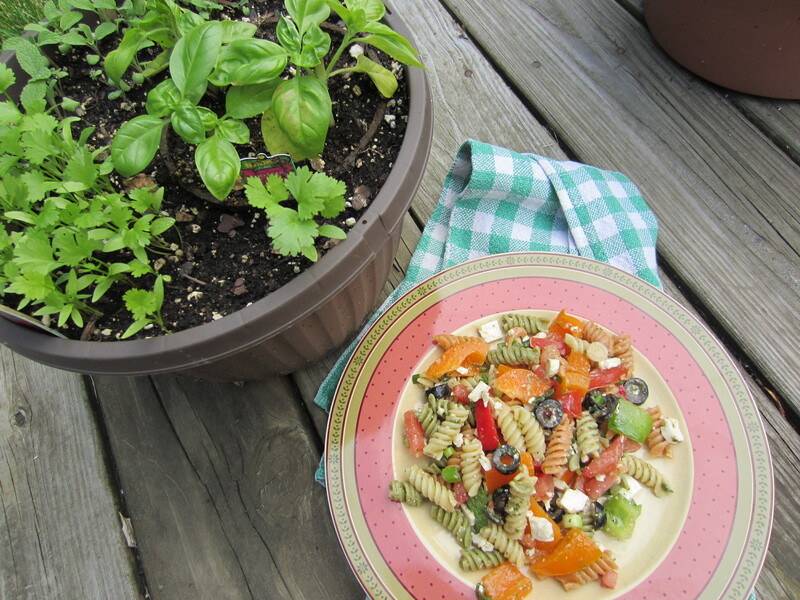 Here’s a good portion of a fresh pasta salad that you can have! Bring a large pot of water with a dash of sea salt to a boil. Add the pasta and cook for 8 minutes. Drain, and run pasta under cold water to stop the cooking process. Set aside. Process the olive oil, vinegar, basil, ¼ cup of the green onions, Parmesan, salt, and pepper in a blender or food processor until smooth. Add sauce to cooled pasta and toss. Add the remaining green onion, bell peppers, olives, and oregano and toss. Lastly, add the Feta cheese and tomato and toss. Serve at room temperature. Jenny Craig: This is exactly where you want to be for either dinner or lunch. I love my mom’s pasta salad, but with ⅔ cup of olive oil, 8oz of Feta Cheese, and a number of other sources of fat, it’s just not something you want to eat on a diet. Granted, there’s no bad food, only bad portions…but you’d get to eat…what? Half a cup of pasta? And that would be your entire dinner? So, I challenged myself to take the recipe and volumize it a bit, using lower fat options and adding more vegetables. Granted, there were a lot of veggies already, so I didn’t need to do a whole lot there. But cutting the fat by more than half worked, and it tasted just as good. Success! I will say, however, that I wasn’t super impressed with the fat free Feta cheese. It’s certainly not as good as the real thing. It wasn’t bad though. It adds protein and the pasta salad was better with it. But if you can find reduced fat Feta, I’d recommend going with that instead. 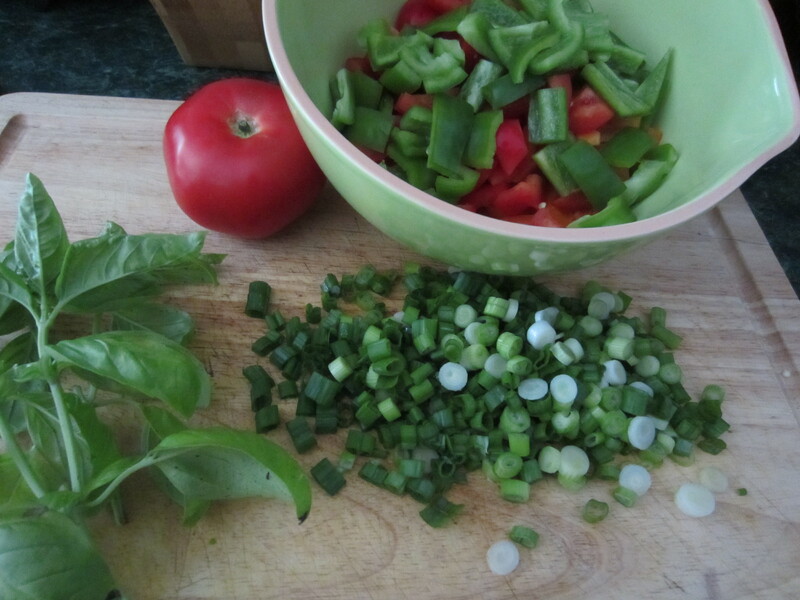 I love the look of fresh veggies, so I took a picture while chopping. Keep in mind that chopping up all this food takes a lot of time (though a lot of that depends on how fast a “chopper” you are). The cook time is simply the time to cook the pasta. Chop your veggies in the mean time. Then use the food processor or blender, pour it all together, and you’re done. And hey, I don’t know if you realized this, but you’re essentially making a basil pesto to pour over pasta and veggies. If you need an easy pesto recipe, just use this. Or, double the ingredients that go in the food processor, then use half on the pasta, and save the other half for later. You can also save time by using a prepared pesto from the store, but you’d have to rework the nutritional information and be very careful. Odds are there’s a lot more fat involved with that route. Really, I was impressed with how easy it was to make the pesto, so I’d recommend giving it a try. There’s a certain satisfaction to knowing you made the pesto yourself. Looks awesome. I’ll try to give it a go this summer. Glad to hear it. It makes a lot, so it’s great for a group gathering, or a picnic, or just something to keep in the fridge and use for multiple meals.